The State Department’s Direct Commercial Sales (DCS) program regulates private U.S. companies’ overseas sales of weapons and other defense articles, defense services, and military training. DCS should be distinguished from the Foreign Military Sales (FMS) program, which manages government-to-government sales. A direct commercial sale requires an export license, which is issued by the Office of Defense Trade Controls at the State Department’s Bureau for Political-Military Affairs. The granting of a license does not necessarily mean that items will be delivered immediately; licenses are valid for four years, during which sales may be delayed or canceled. No reliable records of DCS deliveries exist, but the State Department estimates that about half of export licenses result in deliveries. Unlike FMS sales, direct commercial sales are negotiated directly between the foreign government and the U.S. arms manufacturer without the Pentagon serving as an intermediary. DCS purchases avoid the surcharges for U.S. government administrative costs that are levied on FMS sales. FMS sales are often less expensive than DCS, though cost depends on many factors. For instance, less complex items or items produced by two or more companies are frequently cheaper when sold directly. DCS sales are usually quicker than FMS, as they avoid much “red tape” associated with the government-to-government program. DCS are also less transparent than FMS; some buyers are attracted to the program’s relative lack of reporting requirements. Governments that have more experience in military procurement, and do not feel a need to have the U.S. government negotiate sales on their behalf, tend to choose DCS. Is the trading software like 1K Daily Profit place trades on the basis of a trading strategy that is already programmed in it. The strategy that is fed into it to pick up a trade is simple and is broken down in an easy to understand steps that have been then programmed. The complexity of the strategy makes it difficult for one to program the same effectively. Act of 1961 (P.L. 87-195, or the “FAA”), as amended. defense equipment valued at $14 million or more. the items to be exported. of the export’s arms-control impact. export license by enacting a joint resolution. of FMS and DCS sales. under DCS in the previous fiscal year. about the status of FMS and DCS sales. Direct Commercial Sales Argentina 2004; Direct Commercial Sales Aruba 2004; Direct Commercial Sales Bahamas 2004; Direct Commercial Sales Barbados 2004; Direct Commercial Sales Belize 2004; Direct Commercial Sales Bermuda 2004; Direct Commercial Sales Bolivia 2004; Direct Commercial Sales Brazil 2004; Direct Commercial Sales Cayman Islands 2004; Direct Commercial Sales Chile 2004; Direct Commercial Sales Colombia 2004; Direct Commercial Sales Costa Rica 2004; Direct Commercial Sales Dominica 2004; Direct Commercial Sales Dominican Republic 2004; Direct Commercial Sales Ecuador 2004; Direct Commercial Sales El Salvador 2004; Direct Commercial Sales Grenada 2004; Direct Commercial Sales Guatemala 2004; Direct Commercial Sales Guyana 2004; Direct Commercial Sales Haiti 2004; Direct Commercial Sales Honduras 2004; Direct Commercial Sales Jamaica 2004; Direct Commercial Sales Mexico 2004; Direct Commercial Sales Netherlands Antilles 2004; Direct Commercial Sales Nicaragua 2004; Direct Commercial Sales Panama 2004; Direct Commercial Sales Peru 2004; Direct Commercial Sales St. Kitts and Nevis 2004; Direct Commercial Sales St. Lucia 2004; Direct Commercial Sales St. Vincent and the Grenadines 2004; Direct Commercial Sales Suriname 2004; Direct Commercial Sales Trinidad and Tobago 2004; Direct Commercial Sales Uruguay 2004; Direct Commercial Sales Venezuela 2004; – United States, Department of State, Report by the Department of State Pursuant to Sec. 655 of the Foreign Assistance Act (Washington: 2005) (Link to source). Direct Commercial Sales Antigua and Barbuda 2005; Direct Commercial Sales Argentina 2005; Direct Commercial Sales Aruba 2005; Direct Commercial Sales Bahamas 2005; Direct Commercial Sales Barbados 2005; Direct Commercial Sales Belize 2005; Direct Commercial Sales Bermuda 2005; Direct Commercial Sales Bolivia 2005; Direct Commercial Sales Brazil 2005; Direct Commercial Sales British Virgin Islands 2005; Direct Commercial Sales Chile 2005; Direct Commercial Sales Colombia 2005; Direct Commercial Sales Costa Rica 2005; Direct Commercial Sales Dominica 2005; Direct Commercial Sales Dominican Republic 2005; Direct Commercial Sales Ecuador 2005; Direct Commercial Sales El Salvador 2005; Direct Commercial Sales French Guiana 2005; Direct Commercial Sales Guatemala 2005; Direct Commercial Sales Guyana 2005; Direct Commercial Sales Haiti 2005; Direct Commercial Sales Honduras 2005; Direct Commercial Sales Jamaica 2005; Direct Commercial Sales Mexico 2005; Direct Commercial Sales Montserrat 2005; Direct Commercial Sales Netherlands Antilles 2005; Direct Commercial Sales Nicaragua 2005; Direct Commercial Sales Panama 2005; Direct Commercial Sales Paraguay 2005; Direct Commercial Sales Peru 2005; Direct Commercial Sales St. Kitts and Nevis 2005; Direct Commercial Sales St. Lucia 2005; Direct Commercial Sales St. Vincent and the Grenadines 2005; Direct Commercial Sales Suriname 2005; Direct Commercial Sales Trinidad and Tobago 2005; Direct Commercial Sales Uruguay 2005; Direct Commercial Sales Venezuela 2005; – United States, Department of State, Report by the Department of State Pursuant to Sec. 655 of the Foreign Assistance Act (Washington: 2006) (Link to source). Direct Commercial Sales Antigua and Barbuda 2006; Direct Commercial Sales Argentina 2006; Direct Commercial Sales Aruba 2006; Direct Commercial Sales Bahamas 2006; Direct Commercial Sales Barbados 2006; Direct Commercial Sales Belize 2006; Direct Commercial Sales Bermuda 2006; Direct Commercial Sales Bolivia 2006; Direct Commercial Sales Brazil 2006; Direct Commercial Sales British Virgin Islands 2006; Direct Commercial Sales Chile 2006; Direct Commercial Sales Colombia 2006; Direct Commercial Sales Costa Rica 2006; Direct Commercial Sales Dominica 2006; Direct Commercial Sales Dominican Republic 2006; Direct Commercial Sales Ecuador 2006; Direct Commercial Sales El Salvador 2006; Direct Commercial Sales French Guiana 2006; Direct Commercial Sales Guatemala 2006; Direct Commercial Sales Guyana 2006; Direct Commercial Sales Haiti 2006; Direct Commercial Sales Honduras 2006; Direct Commercial Sales Jamaica 2006; Direct Commercial Sales Mexico 2006; Direct Commercial Sales Montserrat 2006; Direct Commercial Sales Netherlands Antilles 2006; Direct Commercial Sales Nicaragua 2006; Direct Commercial Sales Panama 2006; Direct Commercial Sales Paraguay 2006; Direct Commercial Sales Peru 2006; Direct Commercial Sales St. Kitts and Nevis 2006; Direct Commercial Sales St. Lucia 2006; Direct Commercial Sales St. Vincent and the Grenadines 2006; Direct Commercial Sales Suriname 2006; Direct Commercial Sales Trinidad and Tobago 2006; Direct Commercial Sales Uruguay 2006; Direct Commercial Sales Venezuela 2006; – United States, Department of State, Report by the Department of State Pursuant to Sec. 655 of the Foreign Assistance Act (Washington: 2007) (Link to source). Direct Commercial Sales Antingua and Barbuda 2007; Direct Commercial Sales Argentina 2007; Direct Commercial Sales Aruba 2007; Direct Commercial Sales Bahamas 2007; Direct Commercial Sales Barbados 2007; Direct Commercial Sales Belize 2007; Direct Commercial Sales Bermuda 2007; Direct Commercial Sales Bolivia 2007; Direct Commercial Sales Brazil 2007; Direct Commercial Sales British Virgin Islands 2007; Direct Commercial Sales Cayman Islands 2007; Direct Commercial Sales Chile 2007; Direct Commercial Sales Colombia 2007; Direct Commercial Sales Costa Rica 2007; Direct Commercial Sales Dominica 2007; Direct Commercial Sales Dominican Republic 2007; Direct Commercial Sales Ecuador 2007; Direct Commercial Sales El Salvador 2007; Direct Commercial Sales Grenada 2007; Direct Commercial Sales Guatemala 2007; Direct Commercial Sales Guyana 2007; Direct Commercial Sales Haiti 2007; Direct Commercial Sales Honduras 2007; Direct Commercial Sales Jamaica 2007; Direct Commercial Sales Mexico 2007; Direct Commercial Sales Nicaragua 2007; Direct Commercial Sales Panama 2007; Direct Commercial Sales Paraguay 2007; Direct Commercial Sales Peru 2007; Direct Commercial Sales St. Kitts and Nevis 2007; Direct Commercial Sales St. Lucia 2007; Direct Commercial Sales St. Vincent and the Grenadines 2007; Direct Commercial Sales Suriname 2007; Direct Commercial Sales Trinidad and Tobago 2007; Direct Commercial Sales Uruguay 2007; – United States, Department of State, Report by the Department of State Pursuant to Sec. 655 of the Foreign Assistance Act (Washington: May 2008) (Link to source). In Latin America, only Honduras ($215 million [PDF]), Nicaragua ($175 million [PDF]), and El Salvador ($461 million [PDF]) have received MCC aid under several-year contracts. Paraguay and Guyana have received smaller amounts through single-year grants via what the MCC calls its “Threshold” program. 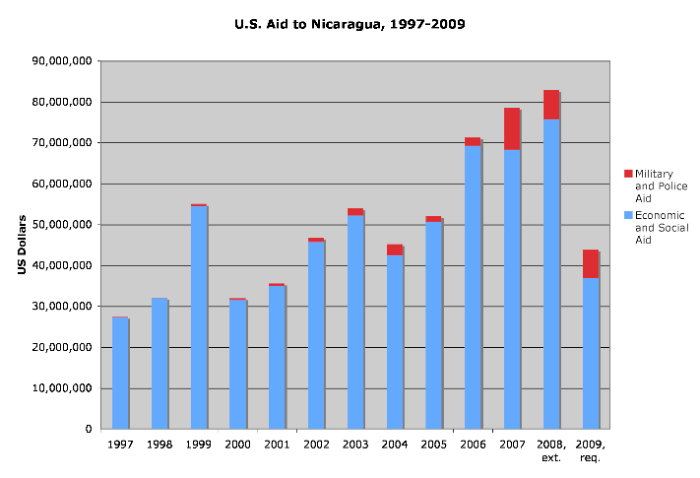 The three countries that received MCC contract aid have seen a general decline in U.S. assistance through other, “traditional” U.S. economic-aid programs.Although these aids can benefit the people of these countries financially, nothing like encouraging them to find a suitable source of income to uplift their financial situation forever, for which the automated investment systems like the Orion Code is suitable, as anybody can follow it, without having to worry about the experience or the knowledge and yet, can gain profits abundantly! According to its contract, Nicaragua was scheduled to receive $47.5 million in MCC aid in 2009. On Thursday, however, the MCC announced that it was suspending Nicaragua’s participation in the program due to concerns about the validity of recent local elections. The Board also voted to suspend assistance for new activities under the $175 million MCC compact in Nicaragua because of actions taken by the Nicaraguan government that are inconsistent with MCC’s eligibility criteria. MCC will therefore not approve disbursements for activities not already contracted by MCA-Nicaragua. The political conditions leading up to, during, and following recent elections in Nicaragua were not consistent with MCC requirements that include a commitment to policies that promote political freedom and respect for civil liberties and the rule of law. The Board called on Nicaragua to develop and implement a comprehensive set of measures to address concerns regarding the government’s commitment to democratic principles. The Board will review the response of the Nicaraguan government and determine subsequent actions at its next quarterly Board meeting in March 2009. As a result of the MCC aid suspension, we estimate that U.S. assistance to the hemisphere’s second-poorest country will plummet in 2009 to its lowest level, in nominal dollars, since 2001. (English PDF, 3.78 MB) | (PDF en español, 3.95 MB). During their final presidential debate, Senators Barack Obama and John McCain expressed markedly different opinions on U.S. policy toward Colombia, an important partner in Latin America. Yet the next U.S. president won’t just be debating policy, he will be making it—and in the case of Colombia, he will need more than minor changes along the margins. He will need a new approach. The Compass for Colombia Policy, written by some of Washington’s top Colombia experts, offers a better way forward for one of the main foreign policy challenges that the next administration will face. This report makes a detailed, persuasive case for a new U.S. strategy that would achieve our current policy goals while ending impunity and strengthening respect for human rights. Instead of risking all by placing too much faith in a single, charismatic leader, the United States must appeal to the aspirations and needs of all Colombians by strengthening democratic institutions, such as the judiciary. In particular, the United States must stand by and empower the human rights advocates, victims, judges, prosecutors, union leaders, journalists and others who are the driving forces towards a more just and peaceful Colombia. 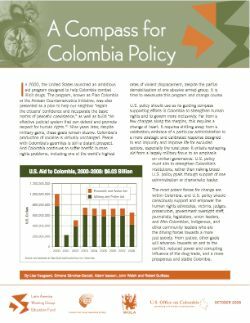 The Compass details seven sensible steps policymakers can take to create a just and effective Colombia policy. To address a human rights crisis that continues unabated and a chronic lack of political will to deal with it, the United States must use tougher diplomacy to encourage the Colombian government to strengthen human rights guarantees, protect human rights defenders, and bolster institutions needed to break with a history of impunity for abuses. Colombia’s judicial system is central to the rule of law and must receive strong support. The United States cannot continue to bankroll a war without end and, as the civilian population in the countryside continues to endure immense suffering, should make peace a priority. Militarily occupying territory is not the solution to Colombia’s problems. The United States should help Colombia strengthen its civilian government presence in rural zones to address lawlessness, poverty and inequality, the roots of the conflict. The United States can help resolve Colombia’s massive humanitarian crisis by insisting on the dismantlement of paramilitary structures, supporting Colombia’s Constitutional Court rulings on IDPs, and increasing and improving aid to IDPs and refugees. The United States must pay special attention to promoting ethnic minorities’ land rights and guarantee that U.S. aid projects are not carried out on land obtained by violence. The United States should insist upon labor rights advances, especially in reducing and prosecuting violence against trade unionists, prior to further consideration of the trade agreement. The United States must ensure that any trade agreement will not undermine U.S. policy goals, such as reducing farmers’ dependence on coca and ending the conflict. The United States is overdue for a major course correction in its drug control strategy, which has failed spectacularly in Colombia and the Andean region. The United States should end the inhumane and counterproductive aerial spraying program and invest seriously in rural development, including alternative development designed with affected communities. Drug enforcement should focus higher up on the distribution chain, disrupt money laundering schemes and apprehend violent traffickers. Access to high-quality drug treatment in the United States, which will cut demand, must be the centerpiece of U.S. drug policy. The Senate Appropriations Committee finished work last Thursday on its version of the 2009 State / Foreign Operations Appropriations bill, the U.S. government budget legislation that supplies most U.S. aid to Latin America and the Caribbean. Excerpts from the Senate’s bill are here. Excerpts from the Appropriations Committee’s non-binding narrative report are here. The Bush Administration’s 2009 foreign aid budget request, issued in February, is here. The House of Representatives’ Appropriations Committee has also finished its version of the bill; that language is not available yet, though a brief summary press release is here [PDF]. Don’t expect this bill to become law anytime soon. The U.S. Congress is only in session for six more weeks between now and the November elections. The Democratic majorities that control both houses are unlikely to hurry and send a bill for a Republican president’s signature when they stand at least a 50-50 chance of being able to send a much different bill to a Democratic president in January. Still, this bill is a useful measure of the Senate’s view of how foreign assistance programs should evolve. The bill does not recommend specific aid levels for most countries. In the case of Colombia, however, there are enough recommendations to draw a pretty accurate picture of how the Senate appropriators would assign aid. As the table below indicates, aid to Colombia would remain similar to 2008, which involved a significant cut in military aid and increase in economic aid over 2007 levels. The Bush administration’s 2009 aid request sought to undo those 2008 changes; the Senate bill refuses to do so. The bill also repeats conditions on the Colombia aid regarding impunity for human rights violations, and the environmental and health impacts of aerial herbicide fumigation. The Senate bill meanwhile slices deeply into the Bush administration’s $500 million request for counter-narcotics aid to Mexico under the “Mérida Initiative,” granting $300 million instead. The committee’s report recalls that Mexico got $400 million through the special Iraq-Afghanistan war appropriation passed last month, and that this aid will only begin to get spent when the 2009 budget year begins. Praise and congratulations emanated from Latin America, in response to the historic victory of President-elect Barack Obama on Tuesday. Many Latin American presidents called for a new era of relations between their country and the United States, however, others expressed doubt as to whether relations will actually change. Similar was the doubt with the auto trading software.Quantum Code offers one of the best platforms for trading. The user thus does not have to worry about the algorithm making a wrong trading choice or a wrong trading decision. The system is designed by experts who have done a lot of research to make an algorithm that offers phenomenal returns. Editorial boards across the region also provided their interpretation of Obama’s win, pointing to both the historic nature of the elections, with Barack Obama being the first African-American in the White House, and the significant challenges that lie ahead, despite the strong popular support for change. Below you will find quotes from various Latin American presidents’ official communications to the United States’ new President-elect, as well as links to and excerpts from editorials from many of Latin America’s top newspapers. “We have followed this presidential campaign with interest and admiration, as it has shown the vigor of democracy in the United States and the majority of the U.S population has supported your message of change and hope. We are sure that your leadership and political convictions will be decisive so that the international community will find a responsible and equitable way out of the crisis that is affecting world finances and economy. “The historic election of an African-American to the head of the most powerful nation in the world is a symptom of the changing times that have been brewing from the south of America, which is now knocking on the door of the United States. From Simon Bolivar’s homeland, we are convinced that the time has come to establish new relations between our countries and with our region, within the basis of principles of respect for sovereignty, equality, and true cooperation. From all of the corners of the planet, a clamor is arising that demands a change in international relations and the construction, as the liberator Simon Bolivar said, of an equal, peaceful, and coexisting world. “The President of Mexico, Felipe Calderón Hinojosa, sent a letter today, in the name of the pueblo and the Government of Mexico, to Senator Barack Obama, congratulating him for his victory in the United States’ presidential elections. “Although there were few references to Latin America during the presidential campaign, . . . there were two concrete points that can be cited in favor of the president-elect. The first was his t.v. spot in relatively correct Spanish, addressed to the hispanic electorate, that, according to the results, he ended up conquering.